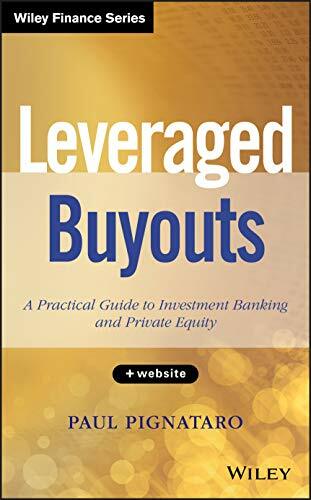 [PDF] Leveraged Buyouts, Website: A Practical Guide to Investment Banking and Private Equity | Free eBooks Download - EBOOKEE! Description: A comprehensive look at the world of leveraged buyoutsThe private equity industry has grown dramatically over the past twenty years. Such investing requires a strong technical know-how in order to turn private investments into successful enterprises. That is why Paul Pignataro has created Leveraged Buyouts + Website: A Practical Guide to Investment Banking and Private Equity. Engaging and informative, this book skillfully shows how to identify a private company, takes you through the analysis behind bringing such an investment to profitability--and further create high returns for the private equity funds. It includes an informative leveraged buyout overview, touching on everything from LBO modeling, accounting, and value creation theory to leveraged buyout concepts and mechanics. Step-by-step financial modeling - taught using downloadable Wall Street models, you will construct the model step by step as you page through the book. Model built complete with Assumptions, Returns to Investors, Debt Covenants, Income Statement, Cash Flow Statement, Balance Sheet, Balance Sheet Adjustments, Depreciation Schedule, Working Capital Schedule, Debt Schedule. Illustrative concepts on leveraged buyout mechanics aid in conceptual understanding. Hot keys and explicit Excel instructions aid even the novice excel modeler. Concepts are reiterated and honed, perfect for a novice yet detailed enough for a professional. Understanding of various sources of funds (bank debt, high-yield debt, mezzanine, PIK, and equity), uses of funds, and assumption drivers are honed. Model built direct from Heinz public filings, searching through notes, performing research, and illustrating techniques to formulate projections. Includes in-depth coverage of leveraged buyout techniques commonly used by Wall Street professionals including: Paid-in kind securities (PIK) Preferred dividends (with payout or deferred switch) Debt covenants Capitalization and amortization of debt fees Returns to investors Step-by-step we will come up with the expected return (IRR) of the Heinz investment to 3G and Berkshire Hathaway Chapter end questions, practice models, additional case studies and common interview questions (found in the companion website) help solidify the techniques honed in the book ideal for universities or business students looking to break into the investment banking or private equity field. If you're looking for the best way to hone your skills in this field, look no further than this book. No comments for "[PDF] Leveraged Buyouts, Website: A Practical Guide to Investment Banking and Private Equity".